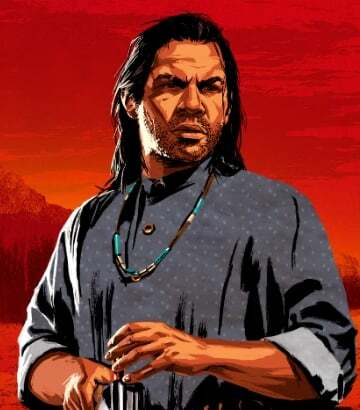 Charles Smith is a Supporting Character in Red Dead Redemption 2. A half black-Native American hunter who has exceptional skills with stealth weapons and tracking. He has the ability to survive out in the wilds which makes him a great asset to the gang. A quiet, reserved, decent, honest man who also happens to be deadly as a fighter. Charles Smith was born to a colored man and a Native American woman. His father and other men of color lived with her tribe for a few years before they were raided, at which point Charles fled with his mum and dad. A few years after, some army men took his mother, and they never saw her again. This leads his father to depression and he resorted to drinking, which left Charles to make the decision to go his own way when he was 13. Smith became one of the most recent additions to the Van Der Linde Gang but has joined other crews before stumbling upon them - he joins the Van Der Linde Gang after the failed ferry robbery in Blackwater. During the event in My Last Boy, Charles decides to help Rains Fall and the tribe escape from the law. Their whereabouts seem to be unknown as the tribe keeps a low profile. After the failed bank robbery in Saint Denis, he cuts his hair into a braided mohawk. He treats the bison as creatures to be cherished and takes action when he catches two cowboys shooting a herd just for fun.